I read this article and found it very interesting, thought it might be something for you. The article is called What Nitish’s 7-Point Agenda Offers Bihar and is located at https://archive.indiaspend.com/cover-story/what-nitishs-7-point-agenda-offers-bihar-26125. The election manifesto of Mahagathbandhan (Grand Alliance) that swept to power in Bihar with 178 seats was based on Chief Minister Nitish Kumar’s 7-point agenda that has pledged an investment of over Rs 2.7 lakh crore ($40.8 billion) as against Prime Minister Narendra Modi’s promised package of Rs 1.25 lakh crore ($18.9 billion). IndiaSpend had analysed Bihar’s development in its pre-poll series. Nitish’s agenda for his state is simple; one, basic infrastructure, and two, education and skill development. The agenda’s main focus is “bijli, sadak and pani” (electricity, roads and water/sanitation) along with a focus on youth employment, education, skill development and women’s empowerment. The biggest share of planned expenditure is for roads. Bihar, home to 8.6% of India’s total population, has only 4.9% of total state highways in India. The agenda promises to connect every village with all-weather roads. This promise is above the Pradhan Mantri Gram Sadak Yojana (PMGSY, PM’s rural roads programme). The central government allocated Rs 1,548 crore in 2014-15 for Bihar under PMGSY, according to Lok Sabha data. A total of 2,139,709 households were electrified in Bihar under the 11th Plan (2007-12) as against a target of 3,828,477 households. The agenda promises that all houses in the remaining villages and habitations will have an electricity connection and get power in the next two years. Only 3.09 million households (16.4%) in Bihar had electricity as the main source of lighting, according to census 2011. Only 10% houses (9.4 million) in Bihar had drinking water source within the house, and only 0.7% had tapped drinking water (0.8 million). 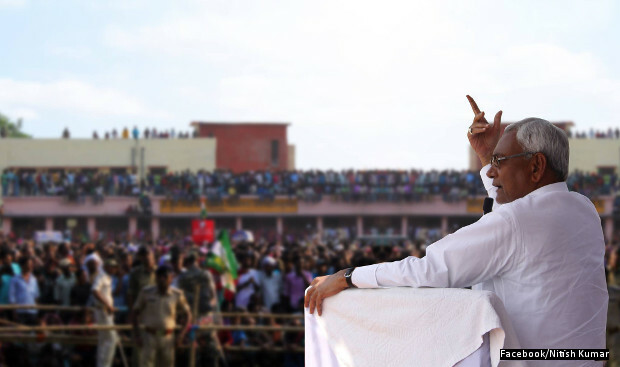 Nitish’s plan is to connect 17.9 million rural households and 1.6 million urban households with water pipelines–a total of 19.5 million households in 5 years. The agenda promises to build a toilet in every home without one by constructing 16.4 million toilets in rural areas and 0.75 million in urban areas for a total of 17.2 million toilets within five years. As many as 14.5 million households in Bihar did not have latrines in their houses and 11.8 million did not have bathrooms, according to Census 2011. After roads, the largest allocation is for youth and skill development. Although Bihar has a very low proportion of young people, unemployment (15- to-29 age group) is higher at 17.5% than the national average of 13%. * Unemployment benefit for youth between 20-25 years – a monthly allowance of Rs 1000/- for a maximum of nine months as they search for a job. Each youth can avail of this scheme twice. * Provide 12th standard pass students credit card facilities for taking a bank loan of up to Rs 4 lakh with a 3% subsidy on the interest rate. * Establish a venture capital fund of Rs 500 crore to provide start-up funds to young people who want to start manufacturing units. * Employment centres for 15 million youth in all 38 districts of Bihar for basic computer education, language training and skill development. Bihar currently has 22 functioning universities of which 21 are traditional universities and one is an open university. There were 278 government colleges and 387 local body colleges in 2013. There are currently only 10 engineering colleges in Bihar. The agenda promises to build five new medical colleges along with a nursing college in every medical college. Every district would also get an engineering college, an information technology (IT) institution for women, a poly-technic and a para-medical institution. As a special package for women, the agenda promises 35% reservation for women in all state jobs, and to increase the existing 35% reservation for women in police sub-inspector and constable posts. Note: Note: The story has been updated to correct the proportion of households in Bihar with electricity as the main source of lighting. This CM has got his priorities right ! Roads, water, education, jobs, toilets …… thank God there are no fancy things like smart cities, nano technology hubs and the kind. I find investments in healthcare missing in the article.